VERO MODERO has some amazing creations, many new, and many not so new, but great all of them... and many great gifts for group members, there's no fee to join the group. Free for group members, there's a fee to join the group, but it's really worth it, you get lots of beautiful skins, and can slap the Midnight Mania boards and Lucky boards, full of really nice skins. Tameless Hair Maya, part mesh, available in many colours. Only one of the poses shown in picture. Join the group to get the great gifts available to members, slap the Midnight Mania board and look for the hunt prizes hidden in the shop. Suit Yourself - Outfit Details Head / Genus Project Classic Bento Head Skin Applier / Bold &... The post Suit Yourself appeared first on MIAA REBANE. *Lost Angel* Enchanting Siren - PoseSet - 3 female single poses with prop - 1 linden. These are just three of the gifts you can get at the Hair Fair, there are about 30. I'll show you some more in future posts. 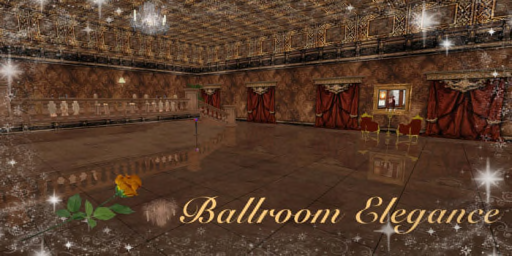 Even though you can visit the ballroom and enjoy the music now, there is an official opening party on Saturday, 8th July 3:00 p.m SL time. So wear your best formal clothes and dance to your heart's content while listening to some of the best romantic music (boleros, ballads, oldies, salsa, bachata, music from Spain, Italy, Mexico, Venezuela, Argentina...). There will be a gift in the entrance, free male and female clothes and a radio. Remember formal attire is required at events. Please, do not use gestures and be respectful. Enjoy your visit and have fun! FREE Hair Bow from Apple May Designs. There are also two Lucky Boards and a gift for group members. It costs 25 lindens to join the group.